I was nominated for one for the third time but didn't win. 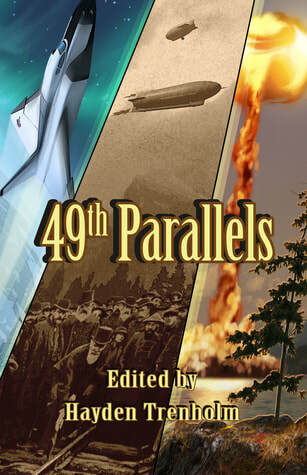 My poem, "Cruising Glaciers," published in 49th Parallels, by Bundoran Press won me my pin. I am delighted to add it to my collection. This year they added the word Aurora to the pin. Well, here it is! I found one. I had the honour of pinning Liz Westbrook-Trenholm with her her lovely piece. It's a wonderful SF Canada tradition. The recipient of the pin, stays at the podium to pin the next winner. I found out at the pinning ceremony that if a recipient loses a pin it can be replaced! Now I can wear my pins! Fear of losing them kept me from proudly displaying them on my lapels. Normally, you can't get a pin for each win unless the pin style changes, then and only then can you get another. Amazing Stories launched at VCon and I am delighted and proud to be listed in the credits, Rhea Rose, as copy editor for this edition. I had a sneak preview of the great stories in the issue! The future is here!